Think about this: A 2015 study published in the Proceedings of the National Academy of Sciences journal reported that nine out of 10 seabirds most likely have pieces of plastic in their guts, with alba- trosses and shearwaters seemingly most prone to eating plastic pieces. Once ingested, the plastic is lodged in birds’ digestive tracts, interfering with their ability to eat. And if they regurgitate to their young, they too face the same fate. The study’s author, Denise Hardesty, PhD, of Commonwealth Scientific and Industrial Research Organization’s Ocean and Atmosphere, used computer forecast- ing to predict that 99 per cent of seabirds will have plastic in them by 2050. The areas of greatest con- cern are in the southern hemisphere, particularly Australia and New Zealand, which have the great- est number of bird species. ric tonnes are microplastics, tiny pieces of plastic smaller than a human fingernail. Synthetic fibres have been found as deep as 11 kilometres below the ocean’s surface—70 per cent of ocean plastics are at the bottom of the ocean—and by 2050, there will be more plastic than fish by weight in the oceans. And there are the five known gyres of plastic, large islands of plastic swarming around the oceans. The Great Pacific Garbage Patch, perhaps the most famous, exists at the meeting of circular ocean currents formed by the planet’s wind currents, which move in a clockwise direction over a 20-million-square-kilometre area. The 80,000-metric- tonne gyre, three times the size of France, contains 1.8 trillion pieces of plastic, most microplastic sized (less than five millimetres long) and is 80 per cent derived from land activity in Asia and North America. As one study noted, it means that most of the ocean’s plastic “is not abandoned fishing gear but plastic bags, milk and water bottles and consumer goods like flip-flops dumped into waterways and washed out to sea.” It’s problematic on multiple levels: The plastics leach out and absorb pollutants; they block sunlight from reaching plankton and algae, which are at the bottom of many food chains; and, of course, many marine animals apart from birds—think turtles and seals—eat them, mistaking brightly coloured plastic pieces for zooplankton. The problem isn’t limited to just animals: A study presented at the 26th United European Gastroenterology Week in Austria in October 2018 reported that people have microplastic in their defecation. Most plastics produced today are fossil fuel– derived polymers, usually carbon combined with oxygen. The problem is it doesn’t biodegrade; instead, it breaks down into smaller and smaller pieces, becoming microplastics. But plastics pose challenges unlike other waste material not only because it doesn’t biodegrade but also because there isn’t one single kind of plastic. Polyethyl- ene terephthalate (PET) and (HDPE) are typically recycled by most municipal recycling programs, yet polyvinyl chloride (PVC) and low-density poly- ethylene (LDPE)—think of your standard plastic shopping bag—can be recycled but typically aren’t for a variety of reasons, including market demand and municipal sorting technology. She recognizes the diversity of plastic material in so many everyday items and points out that the lack of recycling options for some plastic types has made them prevalent in landfill and as litter in waterways. Although CPIA says that the light weight of plastic makes it more fuel friendly to ship than other products, St. Godard notes the energy- and resource-intensive nature of plastic production and observes that the solutions to plastic waste should include reduced consumption, as well as designing products and packaging with material that can be successfully collected and recycled. In other words, reduce, reuse, recycle, in that order of preference. 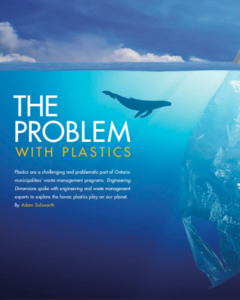 Read the feature in full from Professional Engineers Ontario magazine Engineering Dimensions.